It can be tough to balance work and play. The highest-paying jobs often require the longest hours and the most exciting cities typically come with budget-busting rents. But, while every city has its pros and cons and you likely need to make some compromises, not every city is equal in what it offers its working residents. Below we look through data on employment, home affordability and lifestyle to find the cities with the best work-life balance. In order to find the cities with the best work-life balance, we looked at data on the 100 largest cities in the country. We compared these cities across 10 metrics. We looked at data on the concentration of entertainment establishments, bars and restaurants, housing costs, home values, average weeks worked, average hours worked, average commute times, percent with long commutes, unemployment rate, and labor force participation rate. For more information, see our data and methodology section below. Midwest scores well – Cities in the Midwest occupy four of the top five spots and five of our top 10. These cities tended to have strong economies offering residents plenty of income and employment, while keeping commute times down. Avoid Florida – If you are looking for a good balance between your work life and your non-work life, parts of Florida may be a tough sell for you. 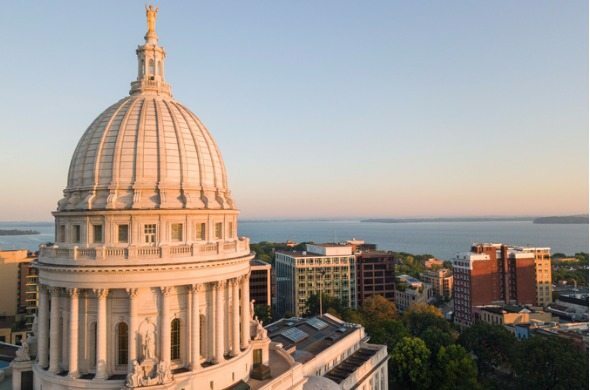 This state has three cities in the bottom five. In general workers in these cities face longer than average commute times – over 26 minutes on average. Residents in thise cities also find themselves paying a large portion of their income on housing. The average full-time worker in those three cities can expect to pay around 40% of their income on housing. 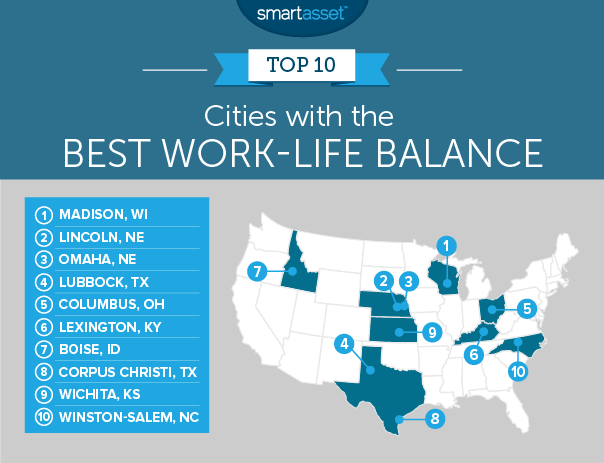 The hard-working residents of Lincoln are rewarded with a great work-life balance. One major concern for many workers is their commute. Rush hour can be a stressful time. Fortunately, commute times in Lincoln are relatively short. The average commute time for someone living in Lincoln is only 18.9 minutes and only 5% have a commute which is longer than an hour. Another plus to living and working in Lincoln is the affordability of the homes. According to our research, the average full-time worker in Lincoln would only need to dedicate a quarter of their income to housing costs to afford the average home. Omaha shares some of the same features as Lincoln. Commutes are short on average and housing is affordable, relative to income. They do have some key differences which separate them. Work in Omaha is slightly harder to find. Omaha has an unemployment rate of 3.6%, which is definitely low but higher than Lincoln’s 2.5%. But life in Omaha can be fun. In Omaha, 1.7% of establishments are dedicated to arts, entertainment or recreation and 1.2% of establishments are bars, a top 5 rate. For people who hate commutes, Lubbock is a good place to be. According to our data, the average commute is only 16 minutes for Lubbock workers, the lowest in our study. Even if you are not one of the residents with a 16-minute commutes, odds are your commute won’t be much longer. Only 3% of residents face a commute over 60 minutes. Work also seems to be widely available in Lubbock. This city has an unemployment rate of only 2.6%. 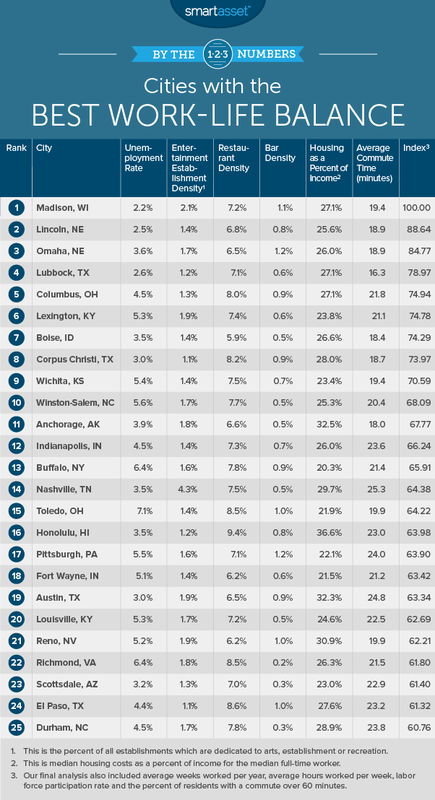 The average worker in Columbus works only 38 hours per week, the fourth-lowest in our top 10. At the same time, they are paid relatively well, especially compared to local housing costs. The average full-time worker in Columbus earns over $41,000 per year and annual housing costs are only $11,200. That leaves the average full-time worker in Columbus dedicating only 27% of their income to housing. With only 27% going to housing Columbus residents can get started saving for retirement. For a city to have a great work-life balance, workers need to find a balance between working and doing the things they love. But for them to do that, they need to have some extra money in their bank accounts to fund their hobbies. On average Lexington residents should have a lot of income left after paying for housing. The average full-time worker in Lexington only needs to dedicate 24% of their income to housing to afford the average home. This means they can spend more money on fun activities. Luckily Lexington has no shortage of fun activities. According to our data Lexington has the 12th highest concentration of establishments dedicated to arts, entertainment or recreation. Idaho’s capital takes seventh. The best part of working in Boise may be the availability of work. This city has an unemployment rate of only 3.5% and a labor force participation rate of 81.4%. Plus, commute times are short. The average commute for Boise workers is only 18 minutes and only 2.6% of them spend over an hour getting to work. The second of two Texas cities in our top 10, Corpus Christi, takes eighth. This city scores pretty well in all our metrics, with standout scores in commute times and unemployment rate. Corpus Christi scores in the top 10 in both of those metrics. However this city scores poorly when it comes to hours spent at work. The average Corpus Christi worker puts in over 40 hours per week, the third-most in our study. Wichita has the most affordable housing in our top 10. That means workers in Wichita should have plenty left for spending on their hobbies or saving for retirement after they’ve paid for housing. One drawback is that workers may be slightly pressed for variety when it comes to things to do in the city. According to our data, Wichita scores no better than 29th on the concentration of entertainment establishments, bars or restaurants. Winston-Salem rounds out our top 10. Residents of this city have a lot of options when it comes to entertainment. According to our data, around 1.7% of establishments are focused on arts, entertainment or recreation. Commutes are also short, the average worker here only needs 20 minutes to get to work. However, finding work in Winston-Salem is a bit more difficult than it is in other cities. Winston-Salem has an unemployment rate of 5.6%. Concentration of arts, entertainment and recreation establishments. This is the number of arts, entertainment and recreation establishments as a percent of all establishments. Data comes from the Census Bureau’s 2015 County Business Patterns Survey. Concentration of restaurants. This is the number of restaurants as a percent of all establishments. Data comes from the Census Bureau’s 2015 County Business Patterns Survey. Concentration of bars. This is the number of bars as a percent of all establishments. Data comes from the Census Bureau’s 2015 County Business Patterns Survey. Housing as a percent of income. This is median housing costs as a percent of income for full-time workers. Data comes from the Census Bureau’s 2016 1-Year American Community Survey. Average weeks worked per year. This is how many weeks per year the average worker works. Data comes from the Census Bureau’s 2016 1-Year American Community Survey. Average hours worked per week. This is the number of hours the average worker works in a week. Data comes from the Census Bureau’s 2016 1-Year American Community Survey. Average commute time. This is the average number of minutes it takes for a worker to commute to work. Data comes from the Census Bureau’s 2016 1-Year American Community Survey. Percent of workers with a commute longer than 60 minutes. Data comes from the Census Bureau’s 2016 1-Year American Community Survey. Labor force participation rate. Data comes from the Census Bureau’s 2016 1-Year American Community Survey. We ranked each city in each metric. Then, we found each city’s average ranking, giving a half weighting to average weeks worked and average hours worked. We gave the unemployment rate a double weighting. Using this average ranking, we created our final score. The city with the best average ranking received a 100 and the city with the worst average ranking received a 0. While balancing work and fun is important, it’s also important to balance short-term and long-term financial goals. Here are some tips to make sure you’re financially ready for retirement. If your company offers a 401(k), it’s a good idea for you to start contributing to it as soon as possible. And if there’s a company match, you want to be sure that you’re putting enough money in there to take full advantage of the match. If you don’t, you’re effectively leaving free money on the table. Consider opening an IRA, or individual retirement account, if you don’t have access to a 401(k). You can choose between a traditional IRA or a Roth IRA. A Roth IRA is funded with after-tax dollars, so when you access the money in retirement you won’t have to pay taxes on it. A traditional IRA is funded with pre-tax money, meaning contributing to one helps lower your tax burden now while helping you save for retirement. When you withdraw money from a traditional IRA in retirement, you will have to pay taxes on it then. The earlier you start saving, the more you can take advantage of compound interest. For example, using our investment calculator, if you invested $1,000 today and earned an annual 6% interest, your investment would be worth $1,791 in 10 years. After 20 years that, same investment would be worth $2,207. In other words, if you’d waited 10 years to invest that money, it would be worth $1,207 less. That’s the power of compound interest.